This is a short route that takes you through birch forest trails then up onto bare rock to a lookout over Rock Lake. The trail to the Rock Lake Overlook branches off from the Voyageur Trail. This seemingly quiet farming and cottage area was much busier in the early 1900’s with railroad, mining and logging camp activity. Rock Lake was named in the early 1900s after the Rock Lake Copper Mine which was located slightly to the north-east of the lake. The ore was taken from the mine to a mill located on the north-east shore of the lake where it was ground down to remove the copper ore. The tailings were dumped into the lake and form what is now the public beach at Old Mill Bay. The mine shipped the copper-bearing ore to Bruce Mines using the abandoned ‘Nip & Tuck’ rail line. 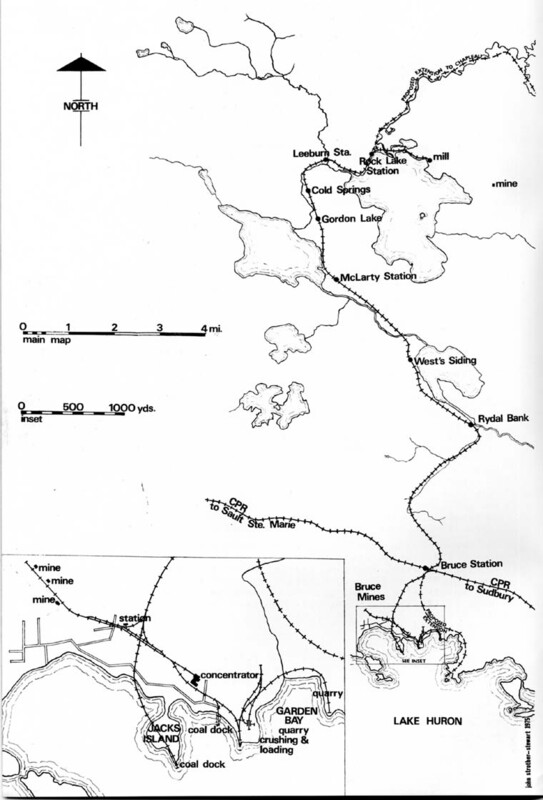 This map shows the location of the mine buildings as well as the old rail line, some of the rail bed is still visible today. The mine was shut down in 1910 after the mining buildings were destroyed by a fire. Rock Lake, Ottertail Lake, and Gordon Lake are part of the Thessalon River system which flows into the North Channel of Lake Huron just east of the town of Thessalon. This was a route that was used to drive logs in the 1930s. From Bruce Mines, drive north on highway 638 for 8.7km, then take the left fork onto Plummer Road. Stay on Plummer Road for 3.5km then turn right onto W Road and drive up the hill for 1.9km and park on the right side of the road just past the cemetery. Find the trail on the west side of the road across from the cemetery. Follow the trail west following white blazes of the Voyageur Trail for 1.1 km. Take the fork to the north(right), possibly marked with blue blaze tape, and follow it north for 300m, up onto a patch of bare rock. From here you can see views toward the south. From the top of the bare rock follow the blue blaze tape to the north-west for 100m and then to the east for about 400m to the lookout over Rock Lake, located on a bare rock hill, just above a farm with fields for horses. Return to the parking spot the way you came.